The Electronic Aircraft (EA) EA-18G Growler is a modified version of the F/A-18F Super Hornet that is used in a naval strike package to jam enemy radar to make the strike package virtually invisible. The EA-18G Growler had its first test flight in August 2006, the later entered service in the U.S. Navy in September 2009. Our Australian allies later adopted the Growler in March of 2015. This aircraft is also able to provide self-defense with AIM-120 medium range air to air missiles, along with the Super Hornet's speed and maneuverability. With this advanced technology, the Growler blinds the radar and the strike package is able to deliver its weapons with pinpoint accuracy with little or no resistance. When you open the box, you are greeted by 6 pieces of sprue that is colored a light to medium gray. There are also four loose parts that are in the plastic. 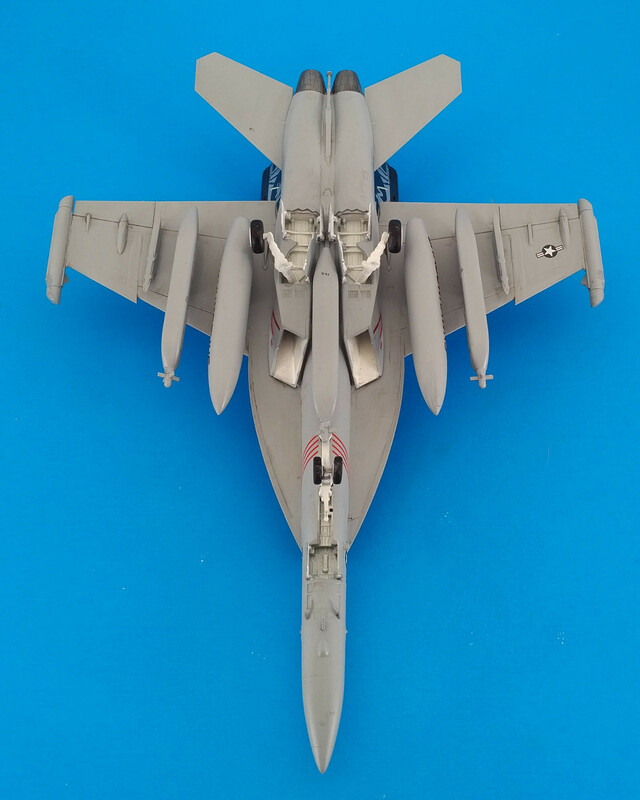 You have a small instruction sheet, and the choice to build either an Australian Air Force Growler, or one of two options from the U.S. Navy Shadow Hawks of VAQ-141. When you examine the parts the mold parting lines look minimal to none. 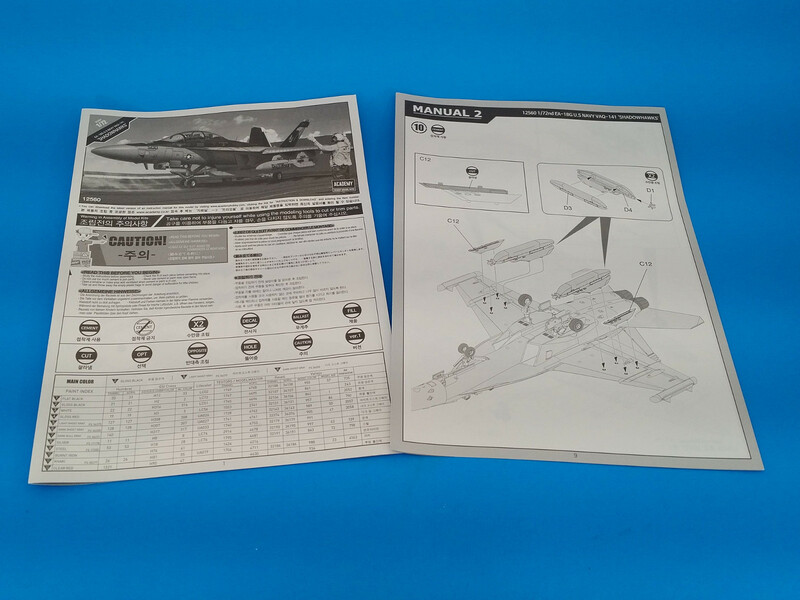 The instructions are designed in a way which allows the modeler to start diving into the build a few steps before tackling the cockpit detail. This is a nice change of pace. The wheel well comes in two parts which makes painting it very easy. There is a bit of drilling to be done in the first two to three steps for holes to mount the gas tank and electric warfare pod pylons. 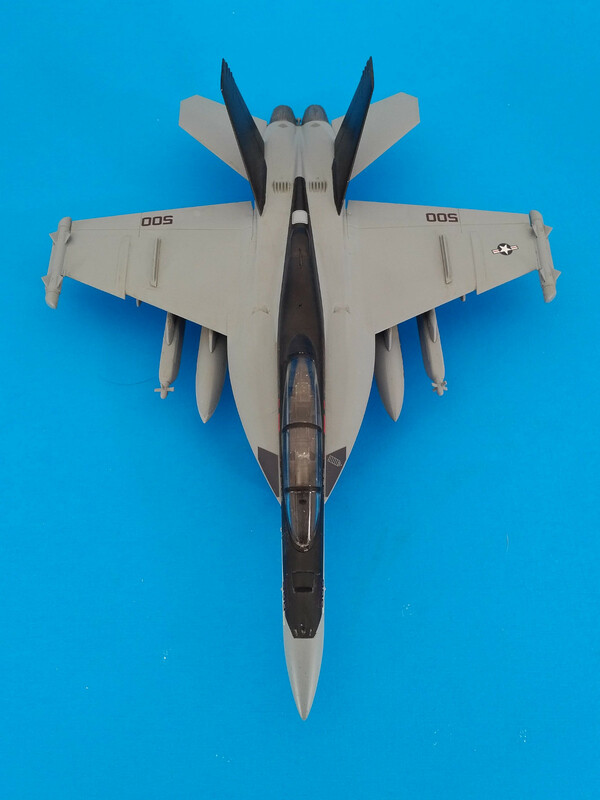 There are also additional parts for the single-seat F/A-18E variant, some of which are electronic countermeasure pods and missiles. The build is smooth and easy. The two parts which I found challenging were the seams resulting from the geometry of the intakes and the mold parting line down the centerline of the tandem. 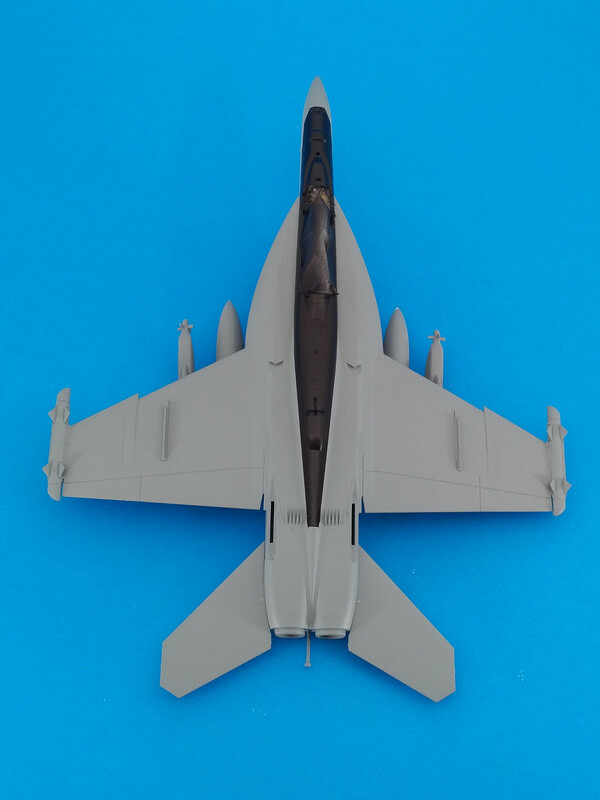 The intakes are made of two pieces and the seams meet in the corners which could cause problems if you don't examine the assembly closely, it became a challenge to fix with putty and paint. Sanding and polishing the canopy seam using a fingernail finishing kit, with coaching from dad, and the application of a coat of Future got me past that hurdle. I painted the aircraft with Vallejo Model Air and Tamiya acrylic colors, followed by a couple of coats of Future to provide a gloss base for the decals. The decals that come with the kit are made by Cartograph. I used Microset and Microsol to help the decals conform to the details of the jet. The decals were a bit on the thin side but they went on just fine. I preferred the paint scheme for the USN Shadow Hawks squadron. If you do the AAF version it is solid light ghost grey and doesn't provide much visual interest. The USN Shadow Hawks EA-18G is a dark ghost on top and with a light ghost grey on the bottom. What provides the most visual interest is the semi-gloss black stripe that runs from the nose to three quarters down the spine of the jet. Low-visibility decals are offered for the AAF option and for one of the Shadow Hawks options. A full-color set of markings are included for the commander's jet, and feature red, black, and dark grey decals. 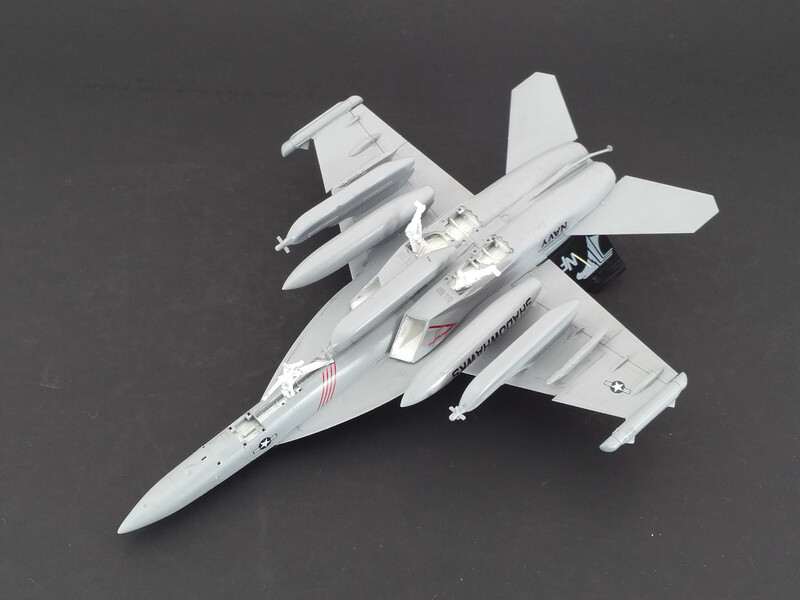 A pretty straightforward build, I enjoyed building Academy's 1/72 Growler, and I would recommend the kit to beginners with a few builds of under their belts and other intermediate and advanced modelers looking for a sweet-looking jet with modest part count and good detail. Thanks to MRC for the sample kit and to IPMS/USA for the opportunity to build it for this review.